Our nurseries are open every day, Monday to Friday. Sessions run from 8.45am to 3.00pm, term time only. Parents / carers can choose their sessions flexibility over the week, subject to availbility. These can either be their 15 or 30 funded hours, or, for children not yet funded, the sessions they pay for. Parents / carers will be able to purchase up to 5 additional sessions per week on a termly planned basis. These additional sessions will cost £17. Two year olds who are not eligible for FEET funding will continue to be charged £16 for their 3 hour sessions, but if they wish to stay all day the afternoon session will cost £17. Some 2 year old children may be eligible for 'Free Early Education for Two year olds (FEET) funding from the term after they turn two. To see if your child is eligible for FEET funding please click here. All 3 year old children are eligible for 15 hours a week of funding from the term following their third birthday. In addition some children from working families are entitled to 30 hours per week of funding which we accept on a flexible basis. If you think this may apply to you please contact us. Alternatively, details of how to apply are available on Surrey County Council's website by clicking here. 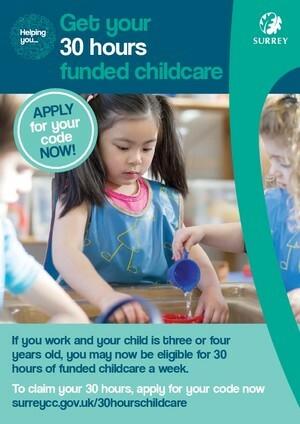 There is also an online tool for checking and applying for the funding via the Childcare Choices website available by clicking here. Their information leaflet for parents is available at the bottom of this page. For places that are not funded fees are to be paid in advance, at the beginning of each week by cash, cheque payable to Pine Ridge and Lorraine Schools or directly into our bank account. If you wish to pay fortnightly/monthly/half-termly in advance or directly into our bank account please speak to the nursery administrator. Please note that in the event of your child's absence, fees remain payable for all sessions allocated. This will ensure your child’s place is held open. When the Nurseries are closed for an In-service staff training day fees are not charged.